This morning I let myself drink two cups of yerba maté. I bought two tea bags from the health food store here on Saturday, my latest approach to letting myself indulge in this addiction now and again. Each sip is delicious, the unique, bitter aroma, the coconut milk and agave a divine alchemy with the sharp flavor. I think of the even more wonderful maté I can buy in bulk from Mountain Rose Herbs. But I don’t let myself buy it because I’ve learned I’ll drink it until it’s gone. And then, I remember the first time I drank that same quality of yerba maté, and it carries me to Ajijic. I am on the sidewalk near the little health food store two blocks from my apartment on Aldama, the one on the frontage road north of the highway, beside the nursery where I bought my bougainvillea for my balcony and that lovely oblong rectangular terra cotta pot. The health food store is run by a woman and her husband who live in Guadalajara. I like them both very much. I pause before the nursery next door, run my eyes over the plants spilling out onto the sidewalk, inhale the scent of gardenias, then move past and enter the open store front. Yerba maté is not a thing in Mexico–it’s more a South American drink–so I don’t really expect them to carry it, but I ask anyway. I’ve forgotten in the moment the owners are from South America themselves. The woman is there today. She nods then smiles at my surprise, walks toward one of the shelves in the small space, hands me a large bag of loose yerba maté. I am shocked they have it, dismayed it’s not in teabags. I buy it anyway, then buy a small sieve from the Soriana in Chapala. I brew it in a glass pitcher in my rental kitchen, strain it with my new sieve. In Palm Springs now, I use the sieve every day, to strain my alfalfa, oatstraw, horsetail, to catch my seeds when I make a glass of lemon water. But this morning I use the two precious Guayaki teabags I have allowed myself. I sit in my courtyard and savor every sip, relish the clarity of the mountains before me, the peace of the late autumn morning. And then I am back in my rental kitchen in Ajijic, the ridge of the hill outside my window, running that deep green Argentinian maté through my Mexican sieve. I mix in the half and half and local honey I bought from the tiangis. I walk out to the balcony, and I sit in my big chair. I sip the creamy hot sweetness while I look out across the lake below, and the crimson flycatcher makes acrobatic swoops from the neighbor’s chimney across the narrow cobblestone street. Dusk nears on the second day of my spring holiday, my first in ten years of teaching. I sit on the patio and move my pen across the page of my notebook to begin my first post for this new year of mine, 54 at 54–All Things Mexico. The task I have set for myself terrifies me, but I push the pen across the page anyway. My mind has been wandering paths as steep and twisting as the narrow callejones of Guanajuato, playing out possible topics for my blog, trying them out in my head. Why didn’t I document my time there, take vivid notes, photograph everything I loved? My fear about the course I have set for myself here makes the question come out harsh, anguished. Why didn’t I take pictures of the horses on the cobblestone streets in Ajijic? I would run to the balcony when I heard one passing by below. Why didn’t I record the sound their hooves made dancing on stone? I don’t have any pictures of the Wednesday market or the cemetery or the grackles roosting in the trees at twilight in the plaza. 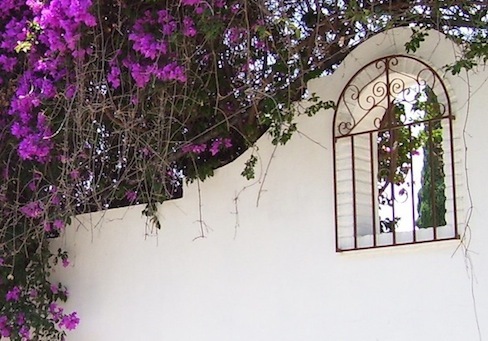 Why, I wonder, didn’t I photograph every doorway, every windowsill, every wall spilling bougainvillea on the street? Why didn’t I photograph every face I came to love, and all the textures and colors that layered themselves inside me, that have me missing Mexico like a river running through my California days? Why didn’t I take more photographs, learn more words, record the stories and the history and the rumors that came my way? Is it because I was not yet a writer in the same way I am today? In part, I know that’s true. And I didn’t know one day I’d want to write a blog about this big love of mine. I was busy taking it all in, absorbing the way it felt inside me, this foreign country where I found such sweetness, such welcome, yet where I was still so much “the other,” my white americana self a sore thumb, standing out amidst the dark hair, the dark skin of the other people in the villages. I think in my usual way I paid more attention to emotions and interactions, to the nuances of finding my way in a culture so different from the one I grew up in. I didn’t document the details, not outer or inner, only let them pile up inside me. Now I am afraid I have set myself an impossible task, but it’s one I want very much to meet. And so, as the light wanes on my California evening, I take a deep breath and reach for trust. I will find ways to write about what I love. I have already begun. A bird I don’t know in the pine tree repeats one long sliding note. I take another breath, the pen loose now between my fingers, and I know dusk settles in Mexico in just this way.